Belcher played every game in his debut season including eight games with club greats, Albert Thurgood and Fred Hiskins. The two champions had been lured out of retirement to fill places made vacant by a long list of injured players and were a great influence on the young Belcher. The following season was one that would be best forgotten by Essendon people. Retirements and injuries to key players made it difficult to put a competitive team on the field and the season ended with just five wins and an eighth place finish. The team's performances in the early part of the 1908 made it possible for everyone to move on from the season just passed. Essendon was clearly on the rise and Belcher played a major part in the club's revival. He grew quickly into one of Essendon's most important players and was regarded by many as the competition's leading ruckman. Belcher was always regarded as a fair player, but mid-way through the season his well earned reputation was unable to help him avoid the wrath of League authorities. He was reported for striking in the match against Fitzroy and was forced to serve a four match suspension. The incident occurred in a fiery clash at the Brunswick Street Oval. The encounter had been a spiteful one throughout and at the end of play both Belcher and Essendon hard man, Jim Martin, found their names in the book. The afternoon's hostilities did not end with the final bell. The crowd had been stirred up throughout the afternoon's battle and Essendon's narrow four point victory appeared to push the Maroon supporters over the edge. The Fitzroy hoard stormed the ground with malicious intent and a number of Essendon players were badly hurt in the ensuing melee. The Essendon players and officials had to wait out the Fitzroy larrikins before making their way out of town. Belcher's leadership qualities were duly recognised in 1910 when the club appointed him to the position of captain coach. The formidable ruck combination he led with Ernie Cameron and Fred Baring dominated inside the crush. 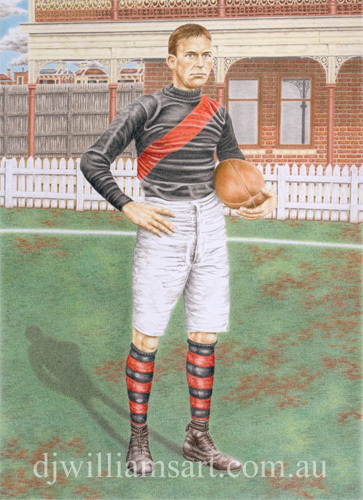 Belcher had taken Essendon to the 1910 finals, but the season was brought to an abrupt end with a demoralising 48 point loss to Collingwood in the first semi-final. 1911 saw legendary Carlton coach, Jack Worrall, arrive at Essendon and with him came a change in leadership. Champion forward, Dave Smith was placed in charge with Belcher as his deputy. After recording a draw against Carlton in the season opener, Essendon went on to finished the home and away rounds on top of the ladder with 15 wins and just two losses. One of those defeats had come at the hands of Carlton and the two teams were set to meet again in the second semi-final. When Essendon and Carlton stepped onto the MCG it was the first time that numbers were worn on the players' jumpers in a final and Belcher was seen sporting the number 4. Essendon was triumphant that day, but for Belcher, it was a day of personal misfortune. He sustained an injury that would force him to watch the following week's Grand Final from the sidelines. Essendon gained its revenge over Collingwood for the previous season's semi-final loss and was crowned premiers for 1911 - the club's first premiership in ten years. Dave Smith was injured before the start of the 1912 season and it was to Belcher that Worrall turned when looking for a new captain. Belcher led the team superbly to finish the home and away rounds in third place. Essendon would face ladder leader, South Melbourne, in the second semi-final. When the captains went out to toss the coin before the start of play, it was Belcher's brother Victor who would be making the call for South Melbourne as he stood in for injured captain, Charlie Ricketts. Essendon won the match by 12 points, and in the re-match two weeks later, Alan Belcher gained his well deserved Grand Final victory. He went on to lead Essendon for the next three seasons and his tenure as captain was only interrupted by the outbreak of World War 1. When Essendon re-entered the competition in 1918 after a two year absence, Belcher would once again enter the fray. He stepped aside as captain, and after missing a number of the early games, he played out the remainder of the year with all his usual commitment to the Essendon cause. In round four of the 1919 season, Essendon captain, Fred Baring, missed the game against St.Kilda with an injury and Belcher led the team onto the East Melbourne ground. The Saints went on to win the encounter and Belcher left the ground with a broken bone in his foot. It was the last time that the great Essendon ruckman would be seen wearing the red and black. Sadly, just two years after his final game for the club, Belcher fell gravely ill and was admitted to the Kew hospital where he passed away - he was 36 years of age.